MEN'S CELTIC NECKLACES : BRITISH Made : LOVE2HAVE in the UK! The Best! British made men's Celtic necklaces all handmade in the UK at prices you can afford. Fully guaranteed and returns accepted. 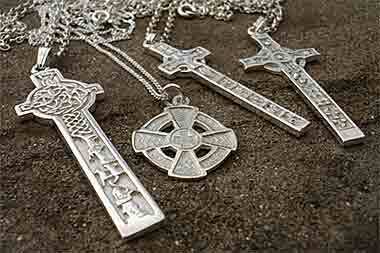 When you think of Celtic jewellery for men, instantly the traditional Celtic cross comes to mind, and while we do feature these most traditional of designs in the form of sterling silver pendants, we have also gone to great lengths to find some more modern contemporary and very alternative Celtic designs for you to purchase. Celtic crosses are the most well-known types of Celtic jewellery, and our alternative cross necklace for men puts a decidedly modern slant on this concept. If you want something different and very unusual how about the Celtic arrowhead, Celtic axe or Celtic dagger necklace? Again, Love2have delivers the alternative while complimenting the traditional too. Prefer a non-leather version of one our men's leather and silver Celtic necklaces?